Today's tutorial is a description of how to edit audio in a YouTube video. Do you want to add some funky music to a video you've shoot or add some nice background music to a video slideshow you just made? YouTube has over 150,000 music tracks which you can easily add to your video. The video is part of a series of tutorial videos on the many ways YouTube can be used by teachers to edit and curate video. You can check out the entire playlist here. Recently I have given several presentations at conferences on the maker movement in our schools. 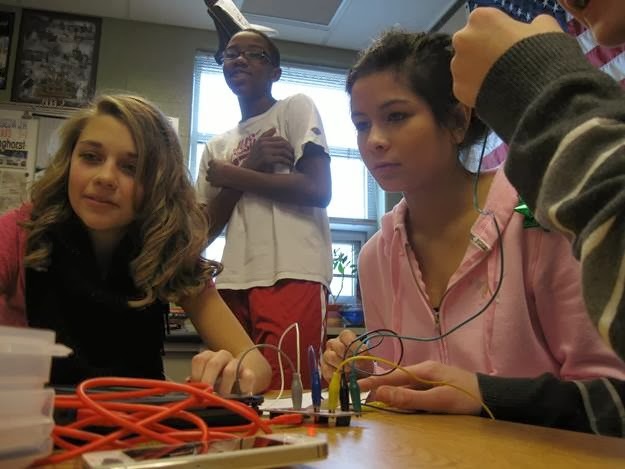 I have become energized in the past year becoming more familiar with MakeyMakey kits, Snap Circuits, Raspberry Pi and a variety of kits and DIY projects. As an educator, and a dad, I think this is an exciting time to be teaching and the maker movement pushes back the discussion to creativity and practical learning. The resources for my "Bring the Maker Movement to Your Classroom" presentation can be found online here. My presentation for this topic can be found below on Slideshare. On day's edition of YouTube tutorials I want to share some of the options you have within YouTube to edit video. Once you have modified, or made a video like we discussed in yesterday's blog post on Creating A Slideshow in YouTube, you can modify the colors and filters. This tutorial is very quick and meant to just introduce several video editing options within YouTube. One feature which I use often is the ability to automatically stabilize shaky video. When I shoot video with my cell phone it often isn't as stable as I would like so this is one of my favorite features. Today I want to share a quick tutorial on one of the most under appreciated features of YouTube - the ability to quickly create a nice video slideshow from your digital photos. You can add effects, filters and enhancements along with a ton of great music available in the audio section. You can add text, transitions and overlays in your video quickly and then upload to YouTube. A great tool for any teacher or student looking to create a quick video from field trip photos, photos taken during a season or event. Today's tutorial explains how to create a unique start and end time for a video within a YouTube playlist. This is helpful for teachers who may want to use part of a longer video with their students. If I had an hour long video on Washington's Crossing and just wanted my students to watch the portion between the minute 5 and minute 8 mark of the video it would be crazy for me to ask my kids to find just the right clip from the longer video. With this editing tool you are able to specifically highlight just one part of the larger video. YouTube is an incredibly powerful tool for teachers to both create and curate videos for the benefit of their students. It is amazing to think that by creating a free YouTube channel with your Google account you can reach a global audience. Creating a playlist is a great way for teachers to help organize the huge amount of content on YouTube for your students (and yourself). I would never ask one of my students to physically go into the largest library in the world and "find a book on the Civil War" so I would never ask them to do the same on YouTube. I have already created a YouTube playlist for every unit that I teach in 8th grade U.S. History. Having a playlist, which is basically a folder, already created means that when I do stumble upon a great content video on YouTube it is just one click away from being saved in my playlist for when I want it later. I recently stumbled upon a great video about the Jefferson's gardens at Monticello so I quickly added it to my "Monticello" playlist so I can find it later when I teach that unit next. In preparation for a recent workshop I recorded some video tutorials to help teach some of the editing and curation tools available in YouTube. I want to share the first one - Creating a Playlist in YouTube - in this blog post. Over the week I will post different tutorials each day or you can jump ahead and view them all at once in a playlist with all ten tutorials.